He entered the barn full of tobacco hanging and drying everywhere and the aroma there smelled like a tobacco shop. Dressed in khaki work clothes and a straw cowboy hat, the black mustached rugged looking farmer smelled of a musky macho outdoorsman. On his knee layed a bouquet of aged tobacco leaves and he offered each one of us a chance to savor the aroma up close. Then, selecting one large leaf from that bouquet, he rolled it up carefully from end to end into a tight cylinder and put it in his mouth. Now ready to smoke his custom cigar, he cut off one end and lit it, followed by a long slow draw and released a huge puff of smoke up into his tobacco drying-curing barn. 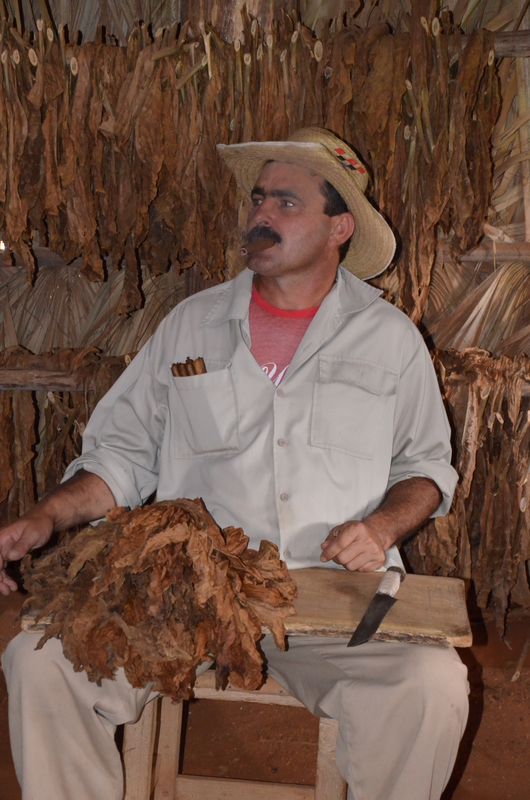 This was Benito, the Cuban tobacco farmer of Vinales, Cuba that resembled the Marlboro man. And his smooth charismatic mannerism of smoking caused the women to swoon approvingly and the men to smile. Benito, with the tobacco bouquet on his knee, preparing to roll out a famous Cuban Cigar. 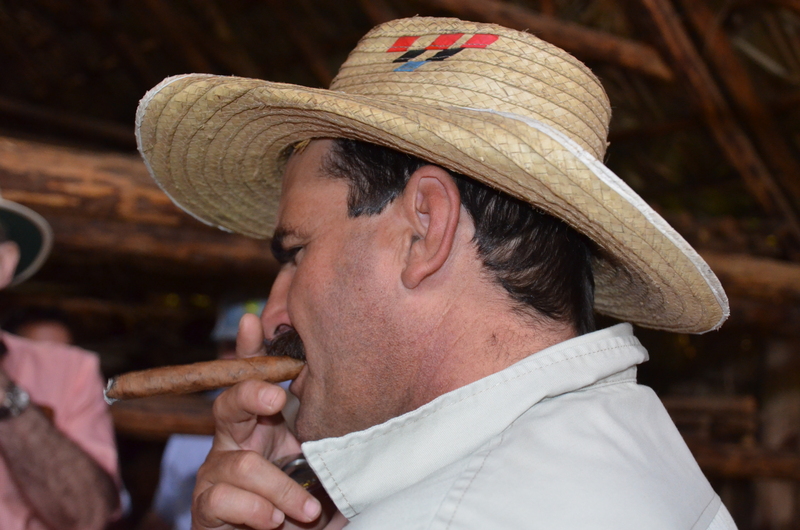 With his pocket full of his Cuban cigars, Benito offered us a chance to smoke one. Benito showed us a trick of putting the burning end of the cigar into his mounth and blowing out the other end, causing a huge stream of smoke. Man after man stepped up for a cigar and Benito personally snipped off the end and then lit it for them. 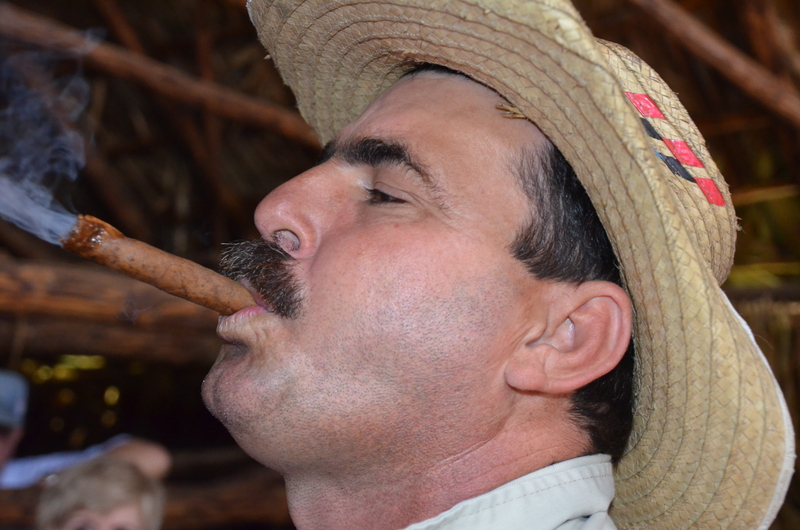 The joy of smoking a world-famous Cuban cigar soon revealed many happy smiles and pleasurable signs of approval. 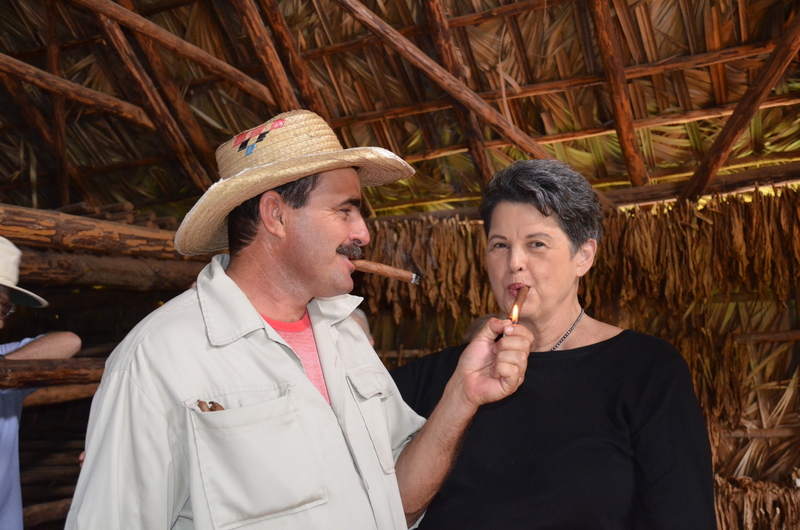 Then it was my turn as the only woman who wanted to puff just once on a world famous Cuban Cigar in Cuba with a “Marlboro Man” Cuban tobacco farmer. So Benito offered one to me, then cut off the end and held the lighter to it for several seconds without anything happening. “Are you puffing on it? He asked.” No, I said. “Well, you have to puff on it to get it going.” So with one slow long draw on that cigar, I got to experience why Cuban cigars are so celebrated and famous around the world. Benito tells me I have to draw on the cigar to get it going. Photo by June. Ah, the taste of a world famous Cuban cigar, another dream come true. We couldn’t leave his tobacco drying-curing barn until he showed us about a tablespoon of “5, 781 tiny black tobacco seeds” that were each about the size of a dot. From each one, Benito said, grows a single tobacco plant and he showed us his field of perfect green plants as we left the barn. Benito showing the 5,781 tobacco seeds so we can see how tiny they are. Explaining the tobacco growing season in Vinales, Cuba, the tobacco growing area of Cuba, we learned why Cuba’s tobacco is so good for cigars. The red fertile soil, the position, angle, and amount of sun and the right amount of rain makes top quality tobacco just like a fine wine. Benito said harvesting occurs around Feb.-March each year as he invited us all into his home for Cuban coffee and Cuban Rum. Walking around carrying a big bottle of Cuban strong amber rum, he laced our coffee with it and the coffee instantly was much more delicious. The Best Cuban rum with Cuban coffee, what a treat, as Jean-Roch looks on. It was amazing that rum could enhance the flavor of coffee to such a degree. And even sipping the concoction fairly fast did not even produce a buzz. 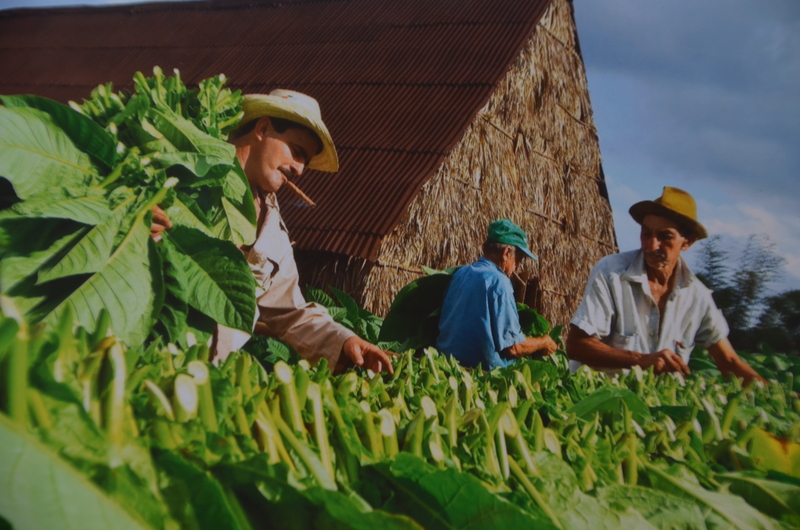 By now, our Tauck World Discovery tour visit was over but before we left, we were invited to tour his old authentic Cuban house and see his photos and tobacco ads of his farm. He showed us his family photos and told us how they have grown tobacco for years. Benito’s tobacco drying-curing barn with the tobacco field nearby. and the aroma that flowed from it indicated it wasn’t long before selling the dried and cured tobacco to make those famous Cuban cigars for the world to enjoy. 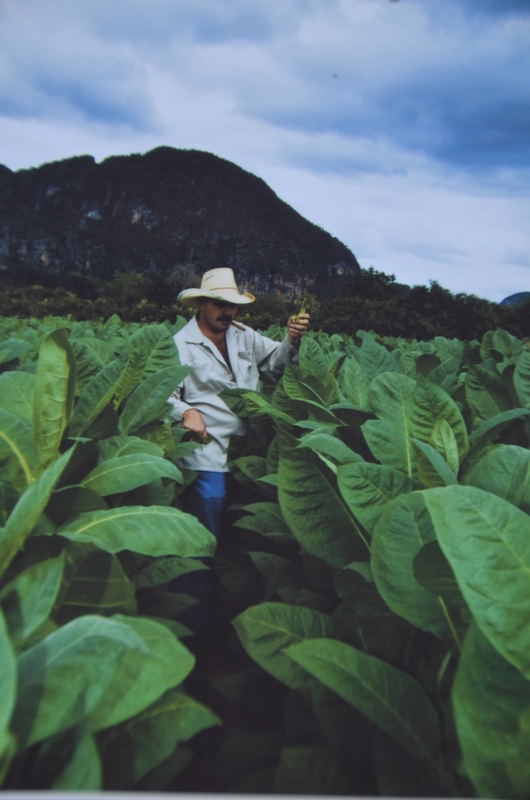 Benito in his tobacco field. Benito and his workers cutting the tobacco leaves to hang them in the tobacco barn for drying and curing. 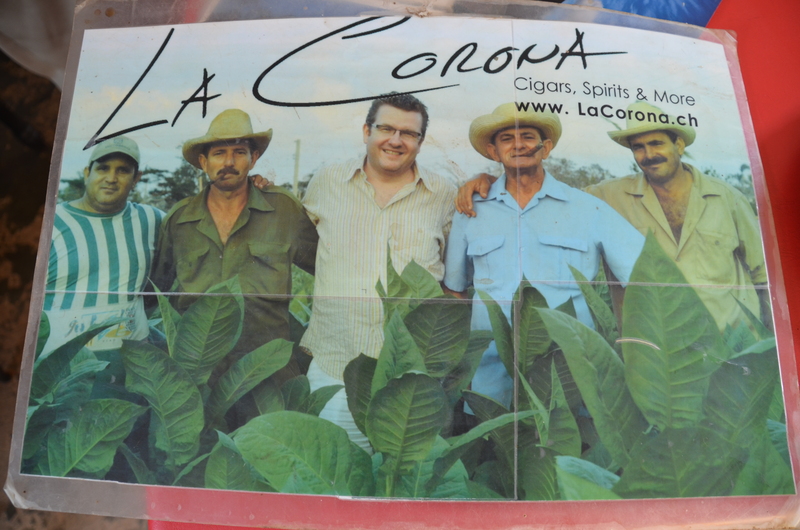 Benito, on the right, in a tobacco ad.